LCD panels of broken laptops or old TVs can easily be turned into multifunctional displays. 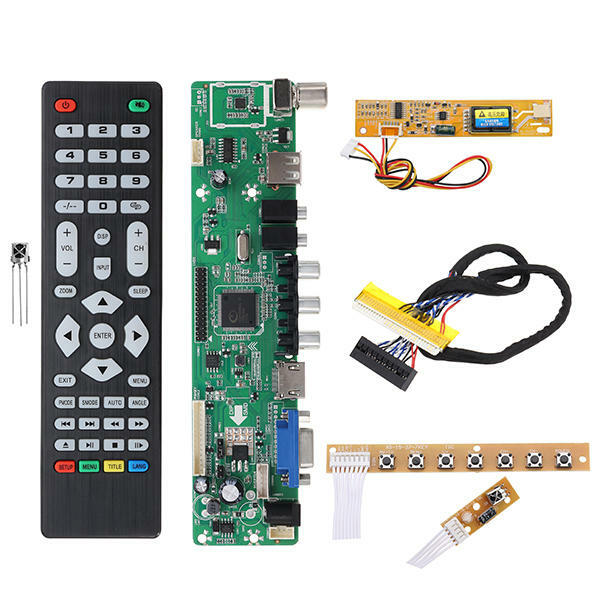 You can give them analog and digital inputs and media player capabilities with a cheap universal controller board. As long as the panel itself is functional, you can use the V56 controller board to drive both the screen and the backlight. Reuse LCD screens as media players, video monitors or computer displays and save them from the garbage dump! 12 volt power supply, I used one from an old DSL router. First of all, remove the LCD screen from it’s housing. In my case it was an old laptop screen, so I detached the lid from the laptop and removed the plastic housing from the screen. According to the specifications you looked up in the previous step, you need to set the voltage jumper on the controller board. There are 3 options: 3.3 volt, 5 volt and 12 volt. Make sure you set the right voltage, ot else the magic smoke might escape! Connect the 12 volt power adapter (do not power it up just yet). Extract the files to your computer. Look for the file that matches your screen’s model number and resolution. If the model is not listed, then choose the “general” type for that resolition. Copy the .bin file to the root folder of the USB drive. Make sure the board is powered off, then insert the USB drive. The power LED should be blinking BLUE for a couple of times while it’s loading the new firmware. If it doesn’t upload the firmware, you should try renaming the file from “LAMV45R.bin” to “LAMV56.bin” (remove the R). The blue screensaver screen should now appear on the LCD panel. Hello! I sent you a question via contact form, I hope you see it. I am not familiar with that board, I only have experience with the V56 board I wrote about. But I will try to answer your questions. I will do it here and not by email, maybe it will benefit others too. work, does it supply power to passive speakers? Do I need an amp? a DAC as well? The other option is to hook up an amplifier and speakers to one of the external connectors like HDMI, AV out, audio out, etc. According to the manual, the board has a second internal header, with 5 pins labeled AV1 AV2, I am not really sure what that one is for. Maybe it is meant for hooking up an amplifier and speakers. In your article it looks like the two speakers you link to just plug right into the LCD board, so do they already have an amp inside them? Or is there one on the board itself? The speakers do not have an amplifier built in, they are just very simple passive speakers with some wire and a connector. You can just plug them right into the board. The board has an amplifier circuit to drive them. Also are there other speaker options available that would make use of the same connection? I’d like the best sound quality I can get so. I don’t know if the 4ohm 3-watt ones are just the ones you picked cause of size or what. You can hook up any kind of speakers to that connector as long as they have the same specs. I got hose speakers because I was sure they had the required specs and compatible connector. They were advertised and being compatible with the board and were very cheap. They are of decent quality for the money if you want something better than I would hook up active speakers to one of the external audio outputs.